I managed to make something last week, something I cut out last fall and then left on my ironing board for eight months. It’s a Make it Perfect Joey Dress, a favorite pattern of mine, and of Lila’s, too. The orange one I made when she was in Kindergarten rivaled that first Geranium dress as her most loved and most often worn garment. I have no idea why this sat for so long. Once I started it, the top half was finished in a couple hours, and I would’ve happily kept sewing if I’d cut out two skirt pieces rather than just one. Instead I had to order more fabric – thankfully Llama Fabrics still had this print (Morse Dot from Katarina Roccella’s Imprint line), so it all came from the same bolt, and I got right back to work when the new fabric arrived. 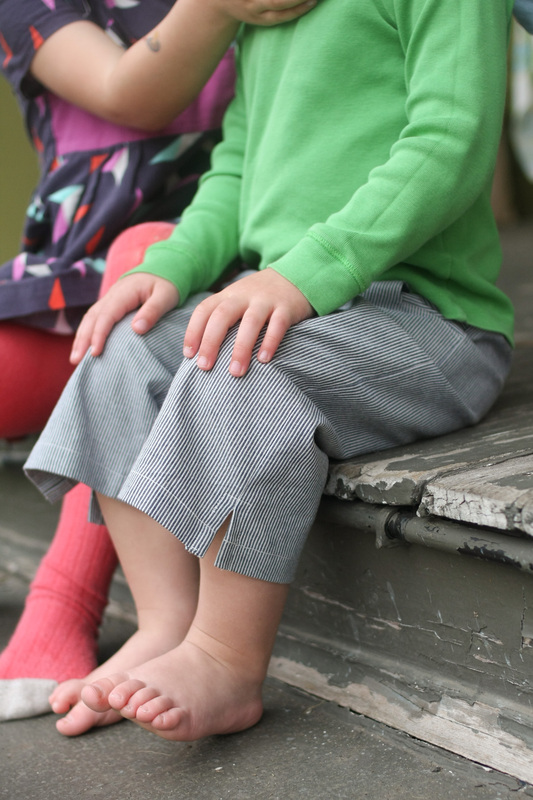 Started on day #1 of Kids Clothes Week, finished on day #7. The fabric is an Art Gallery knit, same as my first Joey. 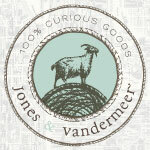 I like these knits for their quality and great range of prints, and because they have enough stretch to make bindings. My only complaint is that there’s some fading, especially with the darker colors. I remember thinking she looked so grown up in that first Joey dress. Same with this one, only about a year and a half growner-upper. ‘Tis the season for monkey bar callouses and backyard raspberries. Happy almost summer! 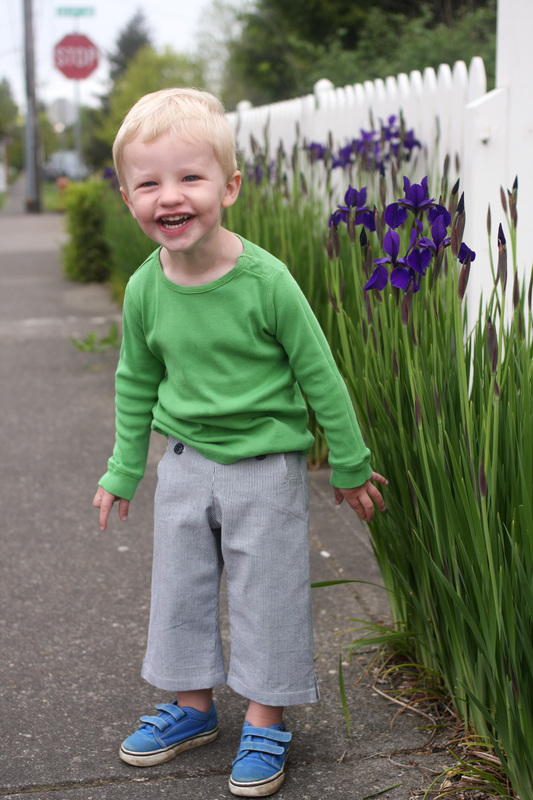 It’s Kid Clothes Week again, and while I haven’t actually done any sewing, I thought I’d share these pants I made for Oscar’s third birthday. You know, back in November. They sorta go with this season’s toy theme though, so I’m seizing this opportunity. 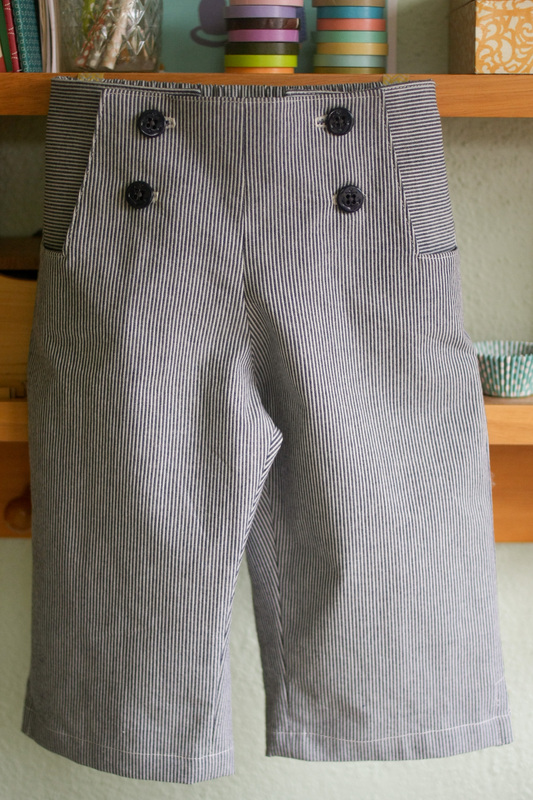 I’ve made him a pair of Oliver + S Art Museum trousers for every birthday thus far, and it’s one of my favorite boy patterns out there. 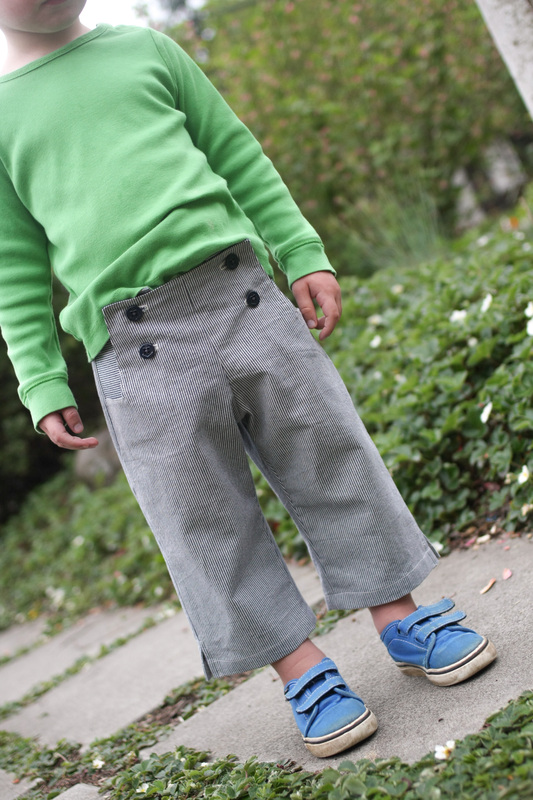 I love the details – back welt pockets, side pockets, faux fly, flat front, belt loops…these are sophisticated pants. A three year old could hardly ask for more. These have obviously been washed and worn at this point, although honestly not all that much. Turns out pants covered in robots don’t exactly go with everything. And yes, they look a little like pajama pants, which is a risk when you use a print like this. 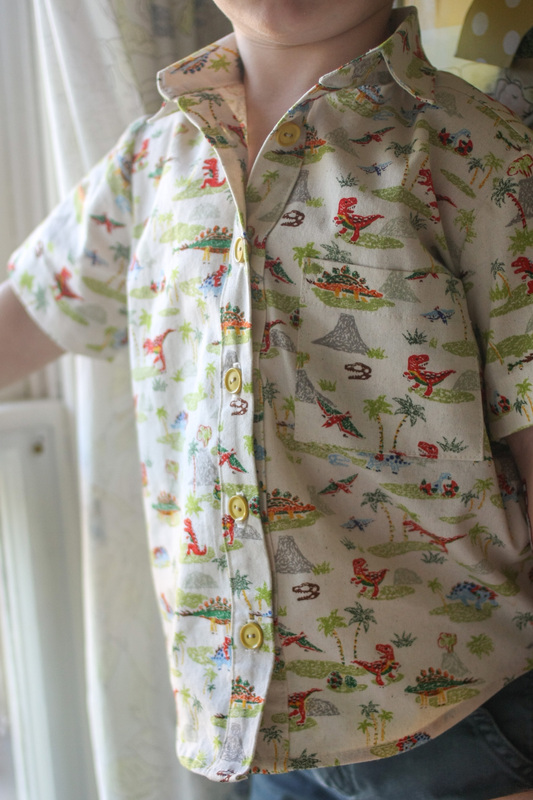 But the fabric (it’s this Echino print) is a heavier weight cotton, which helps bring them back into the daytime realm…and pajamas don’t generally have welt pockets, right? So anyway, it’s only Tuesday…there’s still a chance for me to do some actual KCW sewing. I’m going to try, but lately the TV calls. I hope the rest of you are more productive than I am! 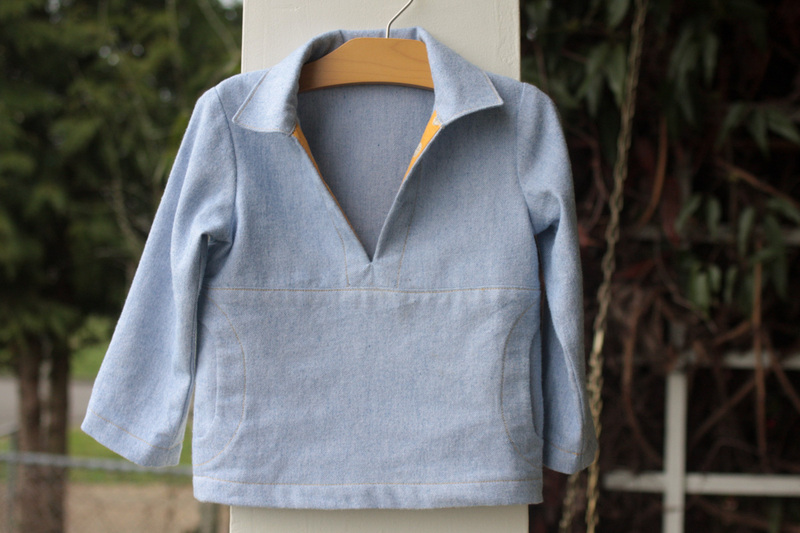 Kids Clothes Week spring edition is officially over, but I’m back with one more project I finished last week. I knew I must have something on my shelf to go with this KCW’s Wild Things theme, and it turned out to be these dinosaurs. After a couple nights work, they became a little Sketchbook shirt. 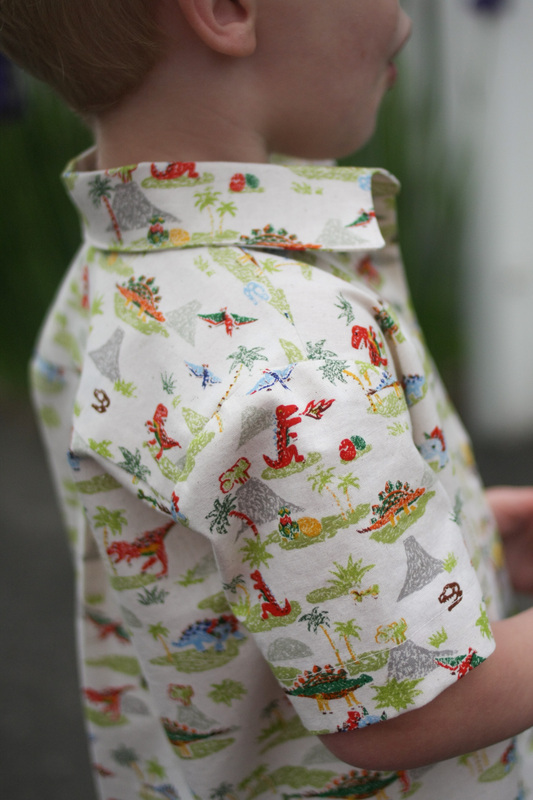 I made this shirt in the smallest size when Oscar was 7 months old – I was so excited for him to wear it, but it never really fit right. This one is better, but not perfect. I made a size 2 (lengthened to 3), and I’m wondering if I should’ve slimmed it down to 18-24 months, because it’s a bit too wide in the shoulders. And there’s something not quite right about the sleeves, I had trouble getting them to lay flat in the shoulder seams. 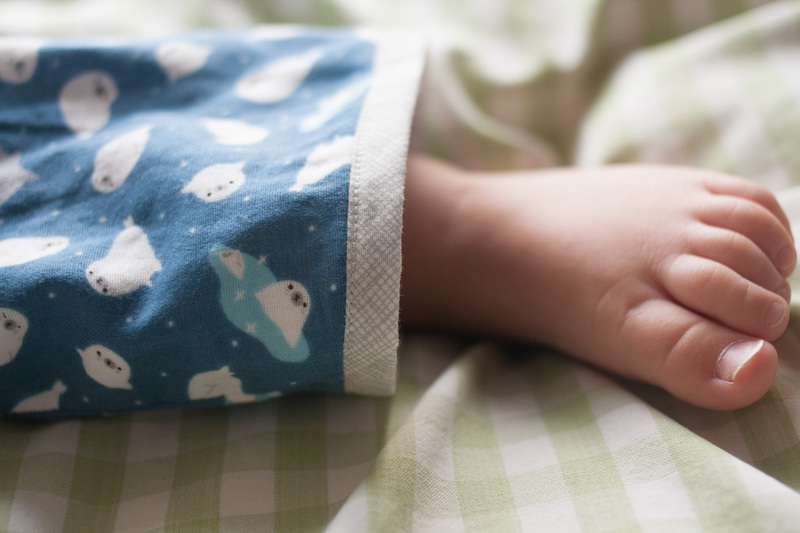 We had a short bout (now over) of beautiful summer weather, during which I learned two things: Oscar is low on warm weather clothes, and he looks awfully cute in his sister’s old elephant pants. 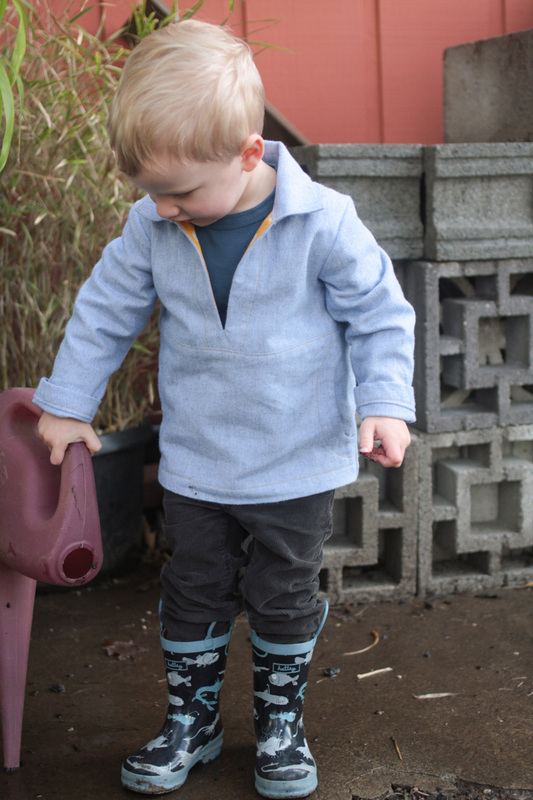 Sailboat pants appear to be the only usable hand-me-down among the our stacks of outgrown handmade clothes – he’s now worn the elephants and these (from 2011! ), and since it’s Kids Clothes Week and all, I thought it might be nice for him to have a pair of his very own. 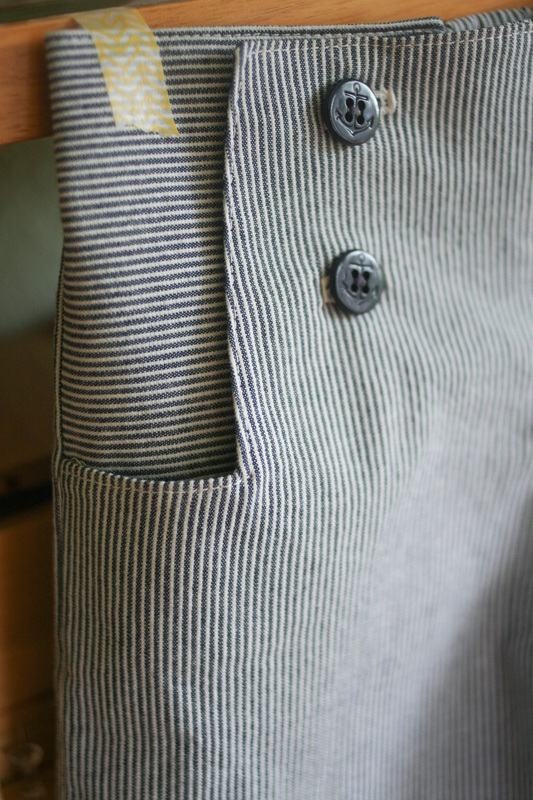 The striped chambray (from Kaufman House of Denim) had been earmarked for several different projects, but I decided to just use it already – it’s neutral and plain, which is normally how I like my Sailboat pants. I did turn the stripes sideways for the side panels though, to keep things interesting. And anchor buttons, because obviously. It’s been almost three years since I’ve sewn a pair of these, and I had forgotten how much I love this pattern – the construction is smart and simple, and they’re surprisingly quick to sew. There are some nice little details, too, like the side vents and the button panel, and they’re easy to get on and off with the elasticized back waistband. Plus: cute. And unisex! 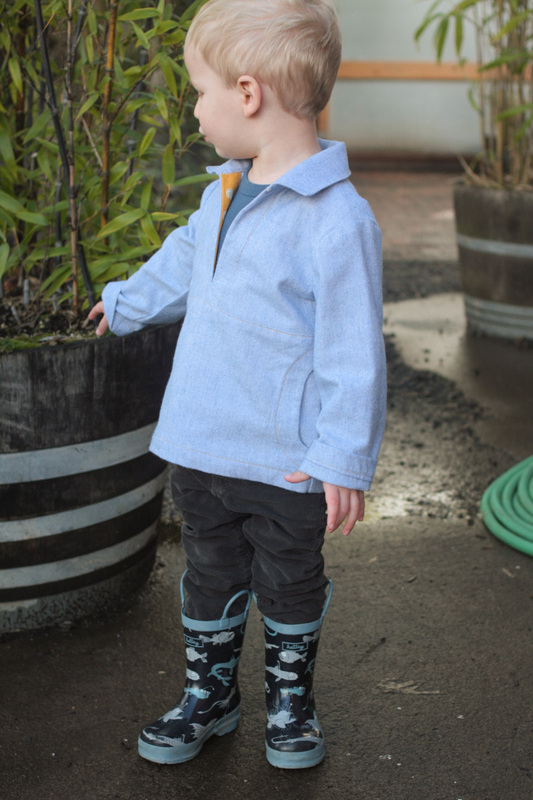 When people ask which Oliver + S pattern to start with, I usually recommend this one. I will mention though – I made a size 3, and the placement dots for the bottom buttons seemed way off to me (which I think I faintly remember from last time) – my advice would be to make your buttonholes (as marked), then stick a pin through the hole to mark where you want to sew on your buttons. And if you happen to have a paper copy of the pattern, check the errata on the website – there are a few (fairly obvious) little things that need correction. Anyway, that wraps up my first days of KCW. 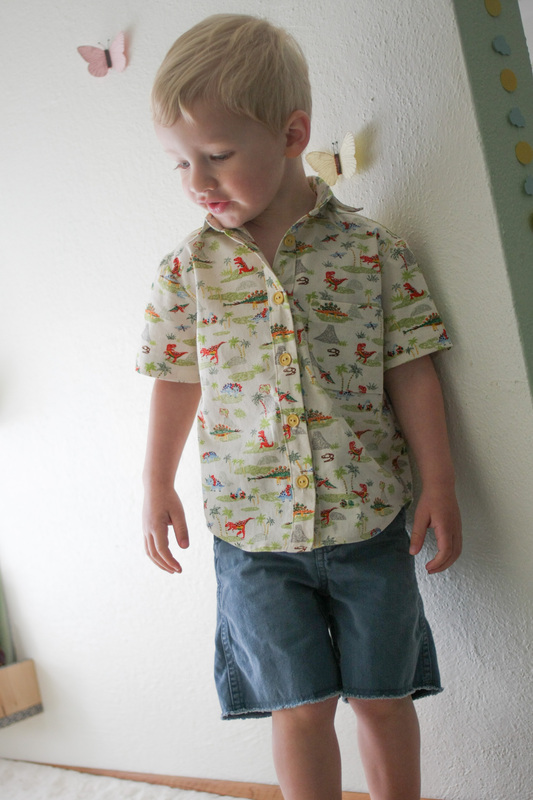 The theme this time around is Wild Things, and while there’s certainly nothing wild about these pants, I’m hoping to sew another warm weather item for Oscar that might fit with the theme a little better. We shall see. Happy sewing! Well, I sewed one thing for this round of KCW. It felt like a major accomplishment! I must be getting lazy in my old age. 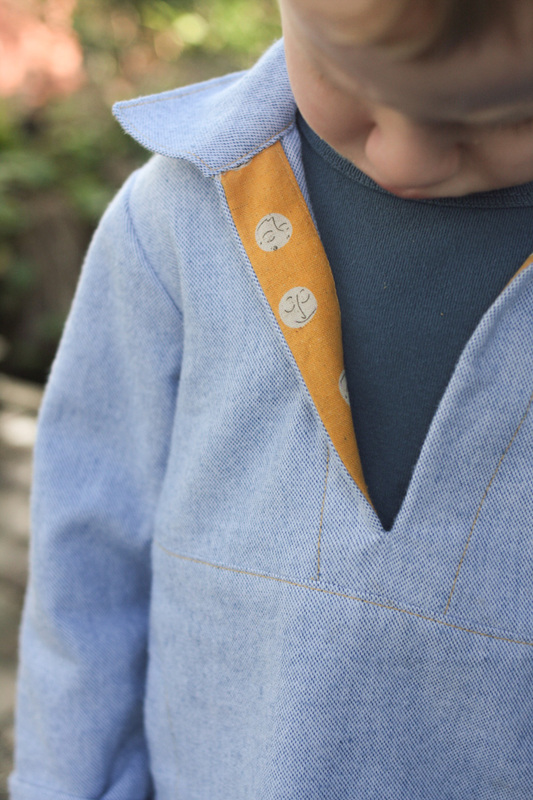 Here it is, a new-to-me pattern, the Oliver + S Nature Walk Pullover. I never really gave this pattern much consideration, but over the summer I fell in love with this version from the Flickr pool and became obsessed with making it for Oscar. It never ceases to amaze me how one person’s interpretation of a pattern can have that effect. Anyway, I immediately traced the size 2 but didn’t get around to it until now, so, tragically, I had to retrace the whole thing in a size 3. Maybe I could’ve gotten away with lengthening the 2, but bigger is my rule of thumb for this kid. I can’t say I love the fit. The arms are too long and the shoulders are big, and it’s a little hard to get on and off unless his arms are straight up over his head, which was same problem I had with Lila’s first Jump Rope dress. Is that just the nature of a garment with an opening like this? But on to the fabric – I really wanted to make mine exactly like Audrey’s, I loved it so much. The sleeves are designed to be made with two different fabrics, but I joined those two pattern pieces and cut each sleeve as one piece, like she did. My plan was to use chambray, but then I found this Kaufman Shetland flannel in Denim – it’s textured and looks like chambray, and it’s the softest flannel I’ve ever felt. So I used that, and for the neck and pocket facings I cut into my precious half yard of Heather Ross moons. I wasn’t sure how much they’d show, and in the pocket facings they really don’t. But because the V opening is so low, they show plenty there. I top stitched everything in a heavy weight gold thread. 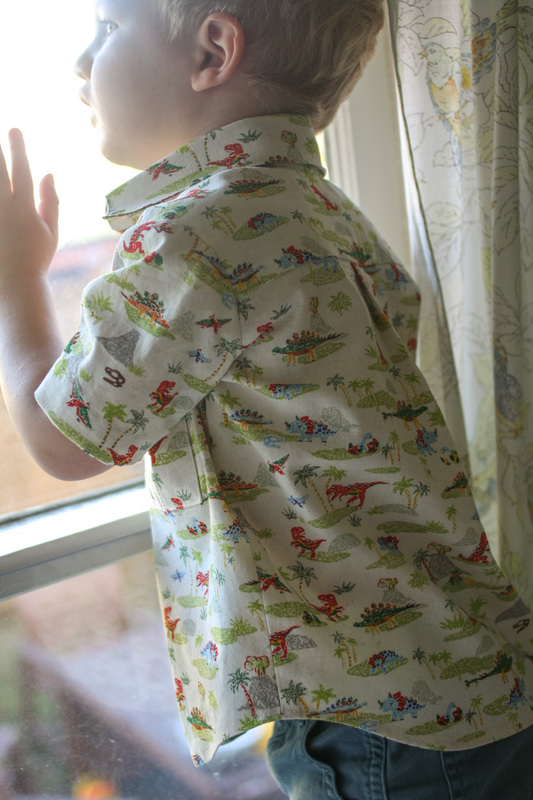 I took a couple of days making this, but the sewing was straightforward and easy, and everything was textbook Oliver + S, a.k.a a total pleasure. 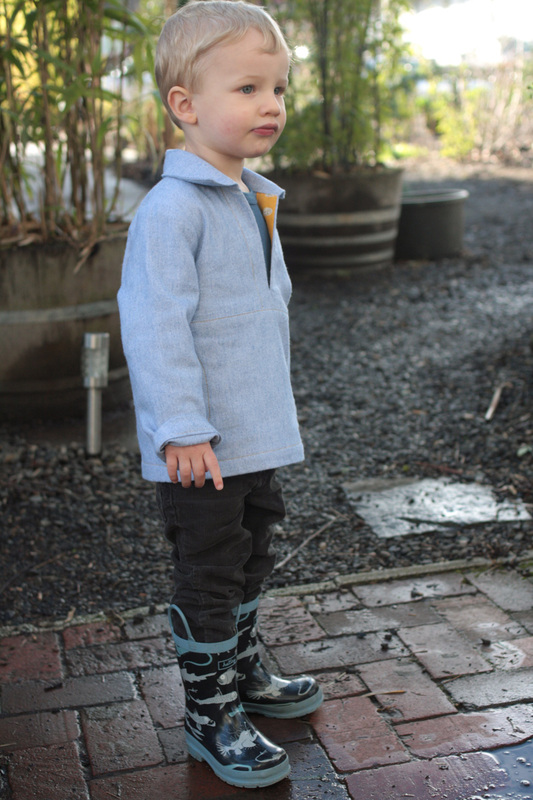 And despite the fit issues, Oscar likes it and I like it and sewing for boys is fun. The end. Halloween! I owe it all to Cherie this year. 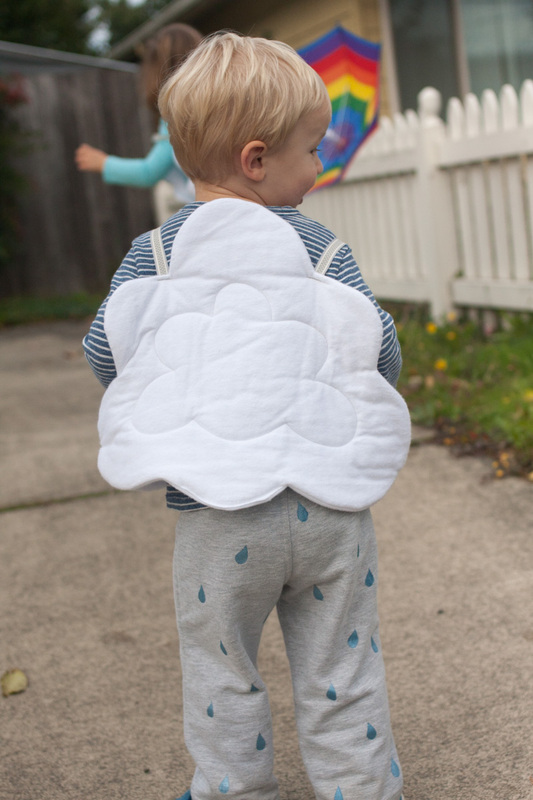 Her rain cloud costume from two years ago was one of the cutest costumes I’d ever laid eyes upon – simple, clever, involves no weird “costume” fabric, and it’s a CLOUD for pete’s sake. 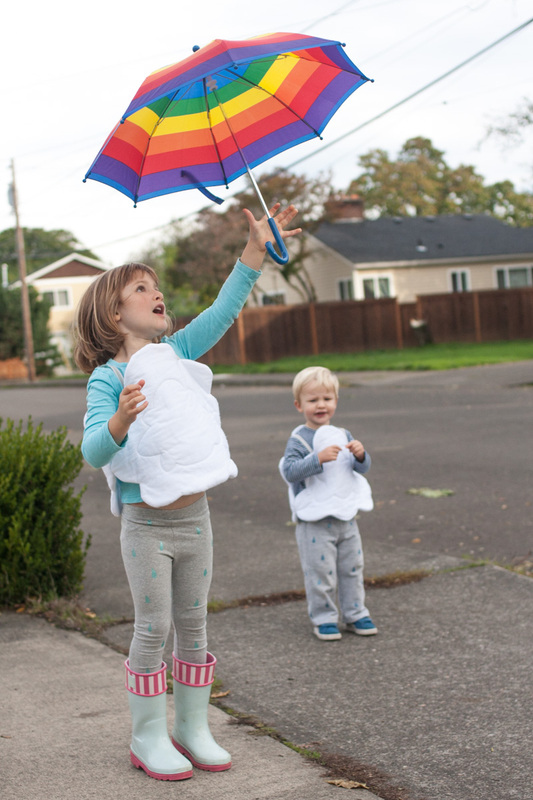 Plus, if you hadn’t heard, it rains here in PDX now and again, so it seemed like an appropriate choice. 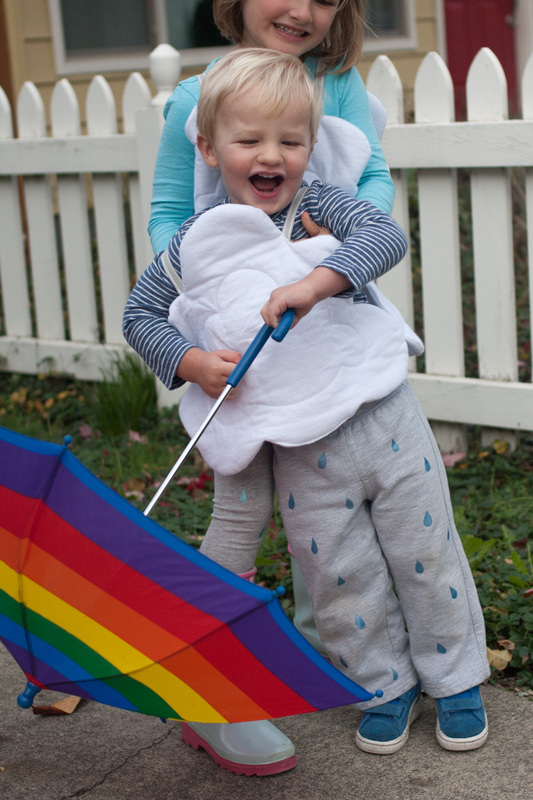 Lila agreed to it right away, and I decided that the only thing cuter than one little rain cloud would be two little rain clouds (read: I didn’t have to come up with two separate things, hooray!). I pretty much followed Cherie’s tutorial exactly, and it was totally great. Two of the quickest costumes I’ve ever made. 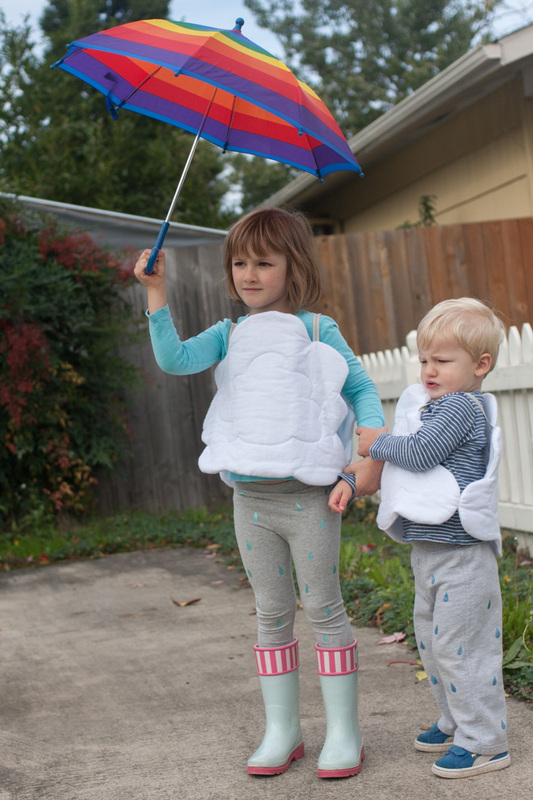 Each cloud is made of one layer of flannel (outside) and one layer of fleece (inside), with a layer of batting sandwiched between. The flannel and fleece are cheap Joann stuff, which they practically give away this time of year. 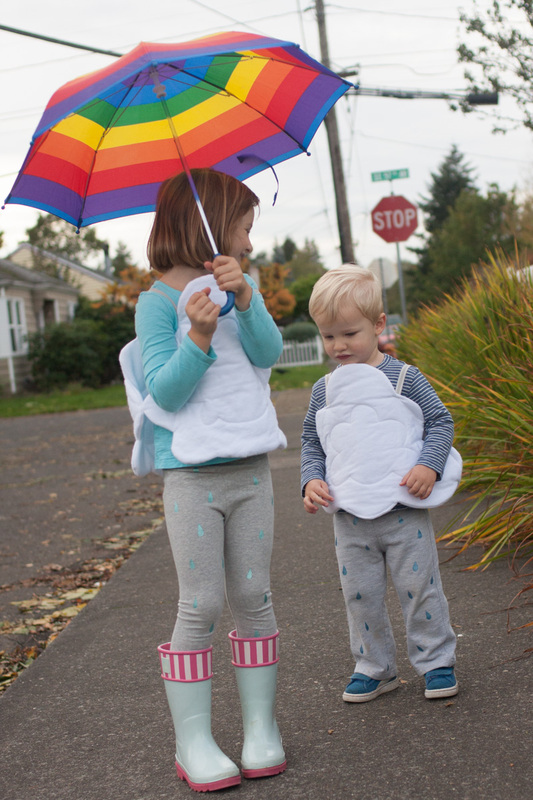 Oscar’s pants came out of his dresser drawer, and Lila’s are Old Navy leggings, which I think she might even wear after Halloween, freezer paper stenciled raindrops and all. The metallic paint (turquoise pearlescent Lumiere) ended up being the most expensive component to the costume at $5.50 (I bought it locally at Collage). I mixed in some of this to make Oscar’s raindrops a little darker. 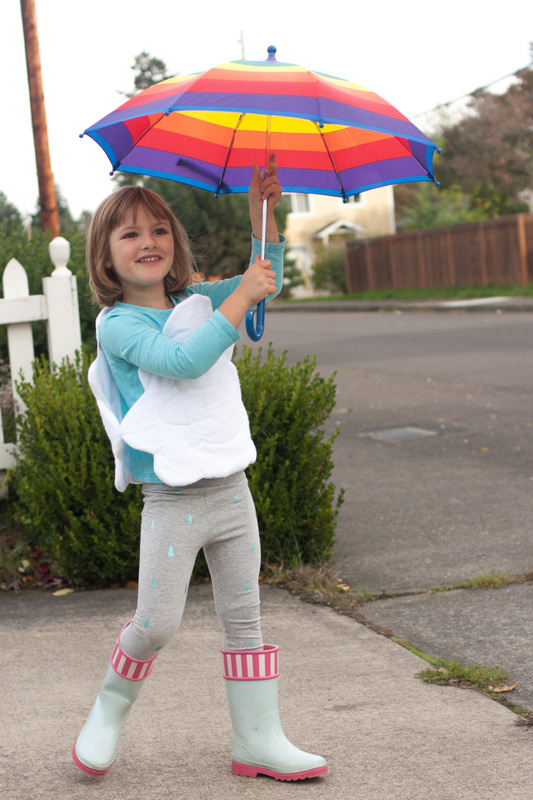 Cheap, easy, didn’t have to think it up myself, and perhaps best of all, I was forced to finish a full week before Halloween so Lila could dress up for her school carnival last Friday, so no procrastination allowed. I could hardly ask for more. 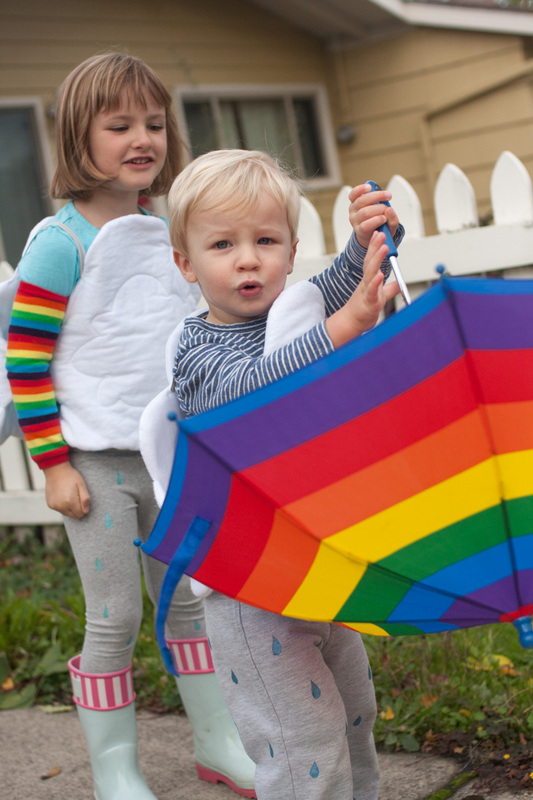 We happened to have this rainbow umbrella which I thought would be a good addition to the costume, only to discover that one umbrella + two kids = one unhappy kid. But they managed to take turns. I also picked up a pair of rainbow leg/arm warmers which Lila may or may not wear on the big day. 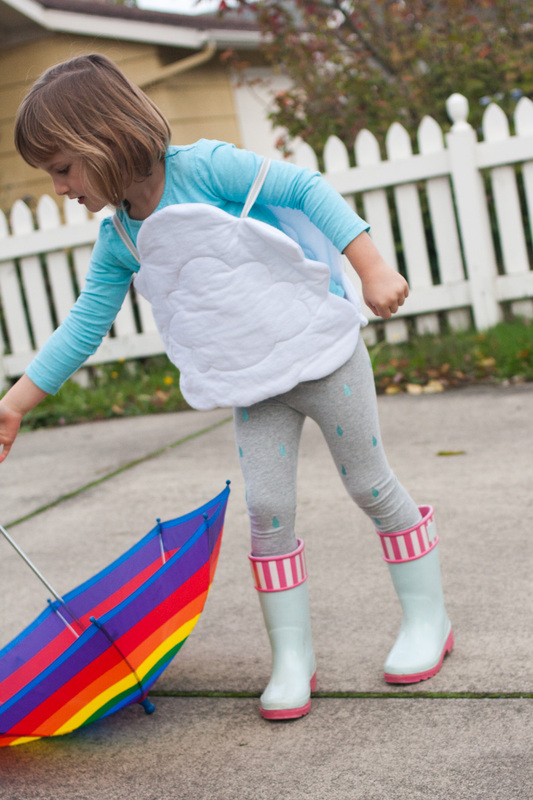 So anyway, I have a feeling the umbrella might be a functional accessory on Halloween night, because the forecast says rain, rain, and more rain. We’re ready for it! It’s Kid’s Clothes Week again, and I’m knee deep in two Halloween costumes (I’m stealing someone else’s great idea this year) and a couple of welt pockets for Oscar’s birthday trousers. 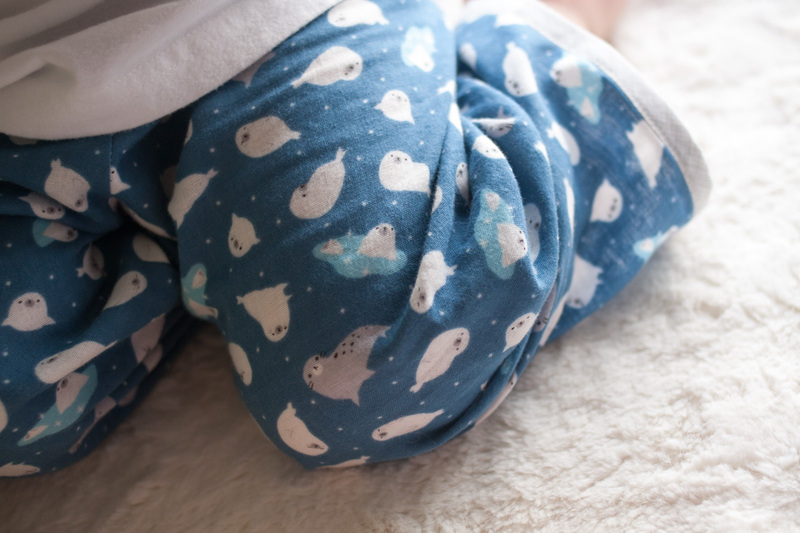 But today I bring you some baby seal pjs. I’ve made so many of these sets (Oliver + S Bedtime Story pajama bottoms with a doctored-up, store bought T-shirt) that I won’t bore you with the details. BUT, these pants are double gauze, and double gauze = special! Every time I sew with double gauze (which happens to be all of thrice so far) I’m reminded that it’s the dreamiest fabric on the planet. These were a third birthday gift for our very special (and therefore deserving of double gauze) next door neighbor friend, who you may remember from here and here. 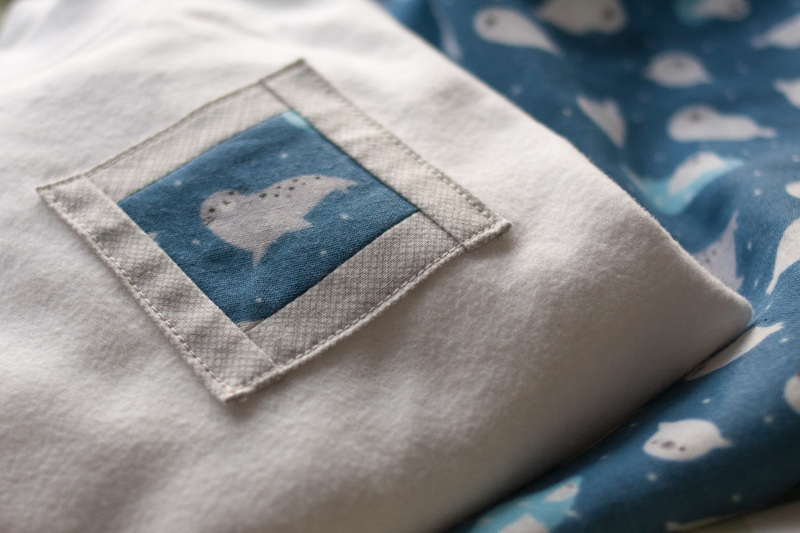 She’s pretty into sea animals and the color blue, so when I remembered Anna’s beautiful baby seal lap duvet, I went searching for the fabric. It was still available on Etsy, so I ordered a yard (which tragically arrived in the mail 15 minutes before the party started, but that’s another story). Oscar modeled for me before we wrapped them up. He wears a size three pretty well these days.